August 8, 2012 - Customs and Border Protection (CBP) officers at Washington Dulles International Airport seized almost 4 pounds of cocaine hidden inside chocolate drink boxes and a spice bottle in two Guatemalan men’s luggage shortly after 10 p.m. Saturday. Esteban Gustavo Ischiu Rojas, 44, and Jose Victor Munoz Lemus, 42, both from Guatemala and travelling together, arrived on a flight from San Salvador, El Salvador, and presented themselves as travelers for business as couriers. CBP officers referred both to secondary inspection for a baggage exam. In Ischiu’s baggage, CBP officers discovered a garlic salt bottle which contained 177 grams, or about 6 ounces, of cocaine. 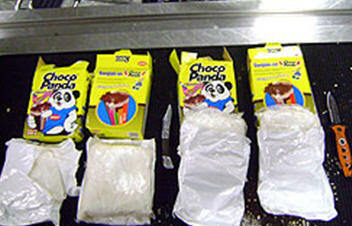 In Munoz’ baggage, CBP officers discovered that four Choco Panda drink boxes contained plastic bags filled with cocaine totaling 1,536 grams, or 3 pounds, 6 ounces. Total weight of the cocaine was 1,713 grams, or 3 pounds, 12 ounces. The street value was approximately $120,000.